Ultra thick 32pt business cards scream dominance. These super thick business cards are the thickest in the industry. 32pt Black Edge Business Card Printing Details - The black edge business cards are the thickest business card in the print industry. The black edge business cards are printed on an ultra thick 32pt card stock. The 32pt business card printing has a 100% thickness of a credit card and has an uncoated rough finish which is perfect for those high-end classy occasions. The 32pt paper does not come with glossy finish (even though you may run across this option at checkout). Additionally, the best results in print quality when printing on this very material is minimalist designs. Photographs do not work as well if you are looking to achieve true photographic image quality such as a human beings face. The uncoated texture is rough and not smooth which makes for inks to soak deeper, thus making a less than crisp photographic look but excellent for solid color shapes and text. Types of Clients Who Buy 32pt Business Cards - The black edge business cards are typically purchased by fancy hotels like the Ritz Carlton, Downtown Law Firms, Interior Decorators and Graphic Designers. Quality of Color Print Production - All 32pt ultra thick business cards are printed using the world's highest state-of-the-art Heidelberg printing presses in an offset method which is the best quality in the world today. Full color production is standard and our cutting process is seamless. You are sure to fall in love with these business cards if you wish to make a classy and dominant impression. Impress Your Clients. Boost Sales. 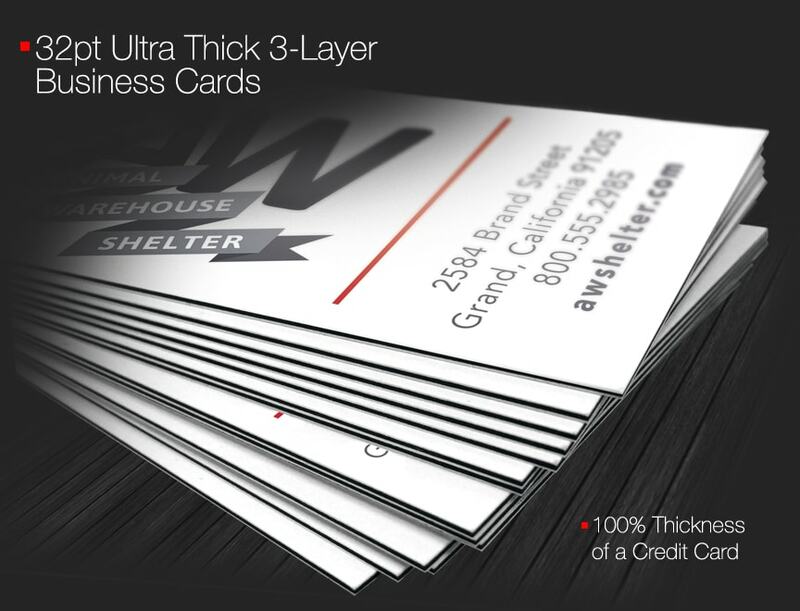 Print 32pt Ultra Thick Business Cards. Fast Service - Experience the most reliable and speedy online printing service available, with 24 to 48 hour delivery. High Definition Color Printing - Online printing services from BlockbusterPrint.com™ are guaranteed to be the highest quality offset methods in the industry or a free reprint is sent out in a flash! ✔ Price Match Guarantee: We are confident that our pricing is the lowest online or we will beat any competitor price of comparable quality. ✔ Locations in California, Texas, Illinois, Ohio, Florida and New York. We route your order closest to you. ✔ We guarantee you a flawless product with the absolute highest quality printing in the country. If you are not satisfied, we will rush out a free reprint right away. 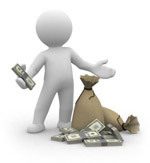 Our service is reliable and hassle free. The holy grain of thick business cards! The 32pt black edge business cards, also known as fat sandwich business cards, have a super impressive 100% thickness of a credit card and come in a dry uncoated paper stock. They do not offer the feature of gloss nor rounded corners or foil. They are created using 3 layers of paper glued together with a center layer being black card stock and sandwiched between 2 layers of premium 16pt uncoated paper. This paper stock is for clients looking to impress on a level not the standard. these cards may not fit in most wallets due to their thickness and are a show piece meant for shorter life span, lower graphic ink designs and meant to impress for the moment. Boutique hotels with a 5-star rating are big purchasers of the 32pt business cards as well as exotic car dealerships, jewelry stores and high-fashion detailers. Once you present a client with one of these 32pt business cards, the purpose you look to achieve is that "wow" factor for that instant moment. These black edge cards achieve that but due to their detailed construction, they are less manageable in the long run as a Silk Laminated business card may be. If you are looking for the wow factor in the moment, these are by far the most unique business cards we offer. We recommend you protect them in a business card holder as its corners are more fragile do to its thicker and delicate nature.